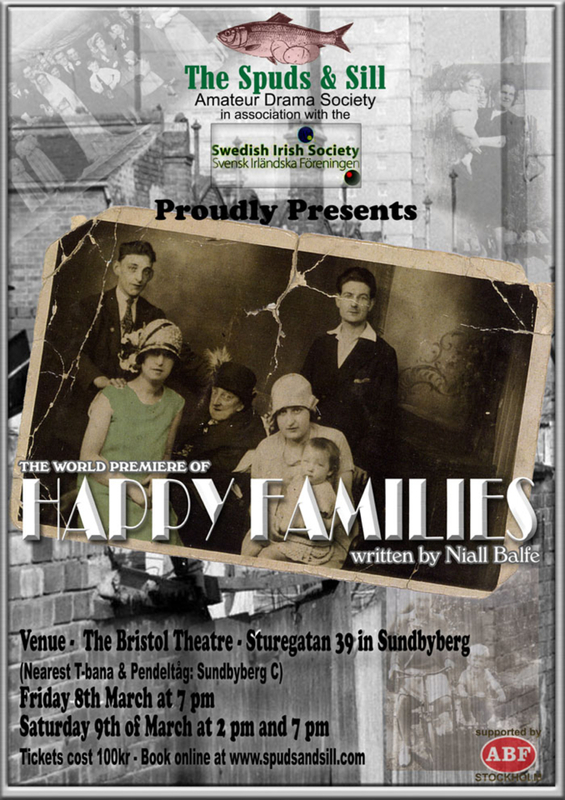 Happy Families – BOOK NOW! Spuds and Sill are proud to present the world premier performance of Happy Families, an original work by Niall Balfe. Click through to see more about the play and book your tickets. Like us on Facebook to keep up with all our news and spread the word to your friends. 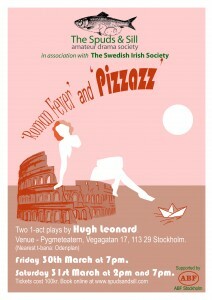 Roman Fever and Pizzazz – BOOK NOW! Booking is now open for our Hugh Leonard double-feature of two 1-act plays! The plays will take place on the evenings of Friday 30th and Saturday 31st of March, as well as a matinee show on the Saturday. We are very excited to be performing at the Pygyméteater by Odenplan. You can book your tickets at our Box Office. Like us on Facebook to keep up with all the latest updates and for behind the scenes footage. Don’t forget to tell your friends. In the warm glow of an Italian afternoon in 1930, two wealthy American widows sit on the terrace of a restaurant overlooking the ancient wonders of Rome. They reminisce about their past friendship and remember a previous visit to the city when they were both young and in love. Now their hopes rest with the prospects of their unmarried daughters. As the sun sets on the Coliseum, bitter jealousies come to light and age-old secrets are revealed. While waiting to rent a cabin cruiser on the River Shannon, two apparent strangers, Marion and Conroy, find themselves seemingly brought together by fate. Marion, an outgoing American, persists in trying to engage Conroy in some role-playing much to his dismay. He is not in the mood for games but can’t help but be sucked in. But in this game, where does the role-play stop and reality begin? We'll contact you max a couple of times a year when we have new productions.